The China-US market continues to grow, as expected, but the segment is showing acceleration in the way that growth is occurring. China Eastern plans to launch Nanjing-Los Angeles service, its first trans-Pacific route from a city outside its Shanghai hub. Hainan will launch a new Beijing-San Jose service, consistent with its secondary city focus, but thicken Beijing-Boston and Beijing-Seattle services with flights to those US cities from Shanghai. Hainan Airlines becomes the first (by two weeks) Chinese carrier to serve a US point from multiple Chinese cities. US airlines already serve Chinese points from multiple US cities. And Delta Air Lines, normally conservative with long-haul growth, has brought forward a Los Angeles-Shanghai service in its five-year plan to a Jul-2015 start date. Not only is Delta accelerating growth, it is doing so on the most competitive US-China route; it becomes the fourth airline on the city-pair after America, China Eastern and United. Delta attributes its growth to the visa liberalisation between China and the US, which Delta says was a surprise. the first time a Chinese carrier will serve the US from a secondary Chinese city. Sichuan Airlines has a Chengdu-Shenyang-Vancouver flight while United has a Chengdu-San Francisco service. Nanjing's first trans-pacific service (Nanjing's only other long-haul service is three weekly flights from Frankfurt to Lufthansa). the first time China Eastern will serve a North American city from outside its home base of Shanghai Pudong. China Southern already has a Wuhan-San Francisco service while its other North American flights are from its Guangzhou hub. Hainan Airlines will start North American routes from outside its Beijing hub (with services from Shanghai Pudong) while Air China only serves North America from its Beijing hub. Nanjing airport is 288km from Shanghai Pudong. The market has traditionally accessed long-haul services via other Chinese hubs (including short flights from Nanjing to Shanghai) or taking the high-speed train. There can be up to 12 trains per hour making the trip between Nanjing and Shanghai in 1.5-2 hours for around CNY140 (USD22) one-way. However, the train does not go to Shanghai Pudong airport, making international connections difficult (the train does stop at domestic-focused Shanghai Hongqiao). Nanjing (NKG) is China Eastern's sixth-largest hub and there will be transfer market opportunities. Nanjing is mostly an outbound market although there are educational links given Nanjing's universities. But the service is unlikely to be profitable on its own. Hainan mooted long-haul routes in 2015 from Nanjing. Further growth from China Eastern can be expected (mostly from its Shanghai hub) as it deploys its new 777 fleet. Hainan Airlines plans to launch three new routes and increase frequency on existing routes in the peak northern season. This will see its number US of routes double. One new route, Beijing-San Jose, is an entirely new market for Hainan Airlines. The two other new routes, from Shanghai to Boston and Seattle, complement existing service to those US cities from Beijing. Beijing-San Jose: Five times weekly service from 15-Jun-2015 with two class Boeing 787 aircraft. This is the first time Hainan will serve San Jose. Shanghai Pudong-Boston Logan: Three times weekly service on 20-Jun-2015. This complements daily (in northern summer) Beijing-Boston service. Shanghai Pudong-Seattle Tacoma: Four times weekly service on 22-Jun-2015 with two-class A330-200 aircraft. This complements daily (in northern summer) Beijing-Seattle service. The San Jose service is consistent with Hainan's approach of serving mostly secondary US cities – not by choice but process of elimination. Hainan is based in Beijing, the hub of flag carrier Air China. China generally permits only one Chinese carrier to serve a long-haul route and Air China has taken the primary pickings, including San Francisco, the larger airport in the San Jose area. (All Nippon Airways actually serves San Francisco in addition to San Jose. ANA has a daily Tokyo Narita-San Jose flight with its 787-8.) Given a choice, Hainan would perhaps have selected San Francisco, but there are clearly fruits to be had in San Jose. Hainan Airlines becomes the first Chinese carrier to serve US points from more than one Chinese city. (China Eastern will do so two weeks after Hainan.) 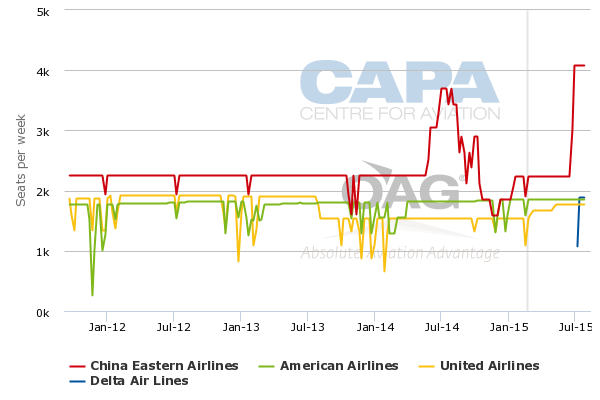 US airlines American, Delta and United already serve their Chinese destinations from multiple US hubs, giving them more city-pairs than their Chinese counterparts. 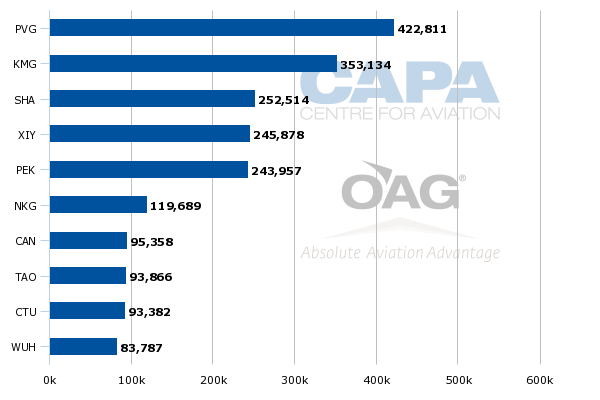 Air China, however, serves the most US destinations. While Hainan has mostly built a North American network with 787s, its use of A330s to Seattle reflects Hainan Airlines is running out of 787s, implying a top-up long-haul aircraft order is all but guaranteed. Boston and Seattle are not the largest markets but are existing Hainan destinations, reducing costs as entirely new stations are not being opened. Hainan will have some insulation as there is less competition to Asia from Boston and Seattle than larger US markets. However, the Boston market in the short term could become very competitive as Hainan's increase comes as Cathay Pacific launches a new route to Hong Kong, which will have (circuitous) connections to mainland China. Hainan will be more dependent on Shanghai-originating traffic as the city does not rank amongst Hainan's 10 largest hubs/bases/stations/focus cities. Hainan will however benefit from the large catchment area around Shanghai that can access long-haul routes via surface transport, including high-speed rail, as noted above with Nanjing. A lesser contributor in the near future will be the passenger base Hainan is trying to establish by converting Shanghai Pudong-based Yangtze River Express from an all-cargo operation to cargo and passenger services. For now, Yangtze is small and synergies with Hainan Airlines are limited. When Delta failed to gain a Japanese partner in the wash up following JAL's bankruptcy in 2010, the US airline felt at a disadvantage to its peers. However, with SkyTeam partners in both China Eastern and China Southern, Delta's position is stronger in what will one day be a vastly larger market. A strong indicator of the growth in the US-China market comes from a new route Delta is now about to launch. And Delta is not just launching any route but Los Angeles-Shanghai, with a daily 777-200 from 09-Jul-2015. Delta will become the fourth airline on the city pair after American Airlines, China Eastern and United Airlines. (Some reports said Air China also serves this route, but that is only with freighter service.) Delta will have a similar level of capacity to American and United, which each have a daily flight, but less than China Eastern's double daily service. This makes Los Angeles-Shanghai one of the most competitive trans-pacific markets based on the number of airlines, and shows fast growth considering only China Eastern served the route five years ago. American and United each launched service in 2011. Delta Air: "The one thing that’s happened in the last few months is the extension of the Chinese Visa program"
During Delta's annual results conference, executives outlined what drove the route decision. From Apr-2015 Delta will move terminals at Shanghai Pudong so it can be in the same terminal as partner China Eastern, whose home base is Shanghai Pudong. This will reduce minimum connection times. Delta says it is currently connecting under 200 passengers a day from Shanghai to other Chinese cities. In 2014, Delta had about 740 daily seats into Shanghai. Assuming an 80% load factor, that means just under one-third of Delta's passengers connect beyond Shanghai. But the driving factor was increased demand from the visa relaxation policy. As Delta EVP & Chief Revenue Officer Glen Hauenstein remarked of the route: "That’s really a long term decision that we’ve been waiting for the right opportunity. It was in the five year plan...The one thing that’s happened in the last few months is the extension of the Chinese Visa program. That was unexpected and so we’ve seen a significant increase from China...we see really strong demand in China materializing in the second and third quarters...we really saw this as a onetime opportunity that was not in the normal course of our business, but given the events that had happened with the relaxation of the visas, given the opportunity we had to relocate [terminals], it was really the right time." While Delta is growing in China, it is reducing capacity in Japan and expects overall Pacific capacity to be down about 4% in 2015. Not stated in Delta's remarks was its battle with American Airlines in the Los Angeles market, which is fragmented and does not have a clear hub carrier. Further, China Eastern is extending its peak Shanghai-Los Angeles service. China Eastern started peak seasonal service in 2014. While China Eastern and Delta are partners, they are still competitors. The US-China market continues to grow rapidly, with the visa liberalisation – as cited by Delta – accelerating some growth. 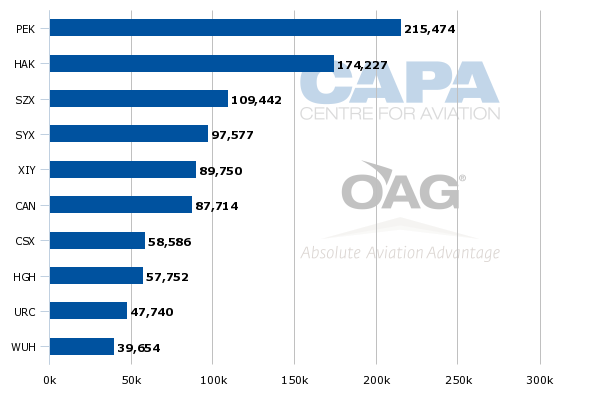 Chinese carriers are becoming larger than US carriers in size but not necessarily scale and power. Serving US cities from multiple Chinese hubs will help Chinese carriers, but the moves from China Eastern and Hainan are so far small: Nanjing is not a primary hub while Hainan's US destinations are smaller. These are important first steps, but the market needs Chinese carriers take on US carriers from the main Beijing and Shanghai hubs. For now, Beijing is mostly exclusively Air China territory and Shanghai China Eastern territory. Successfully competing against each other will put the Chinese carriers in fighting shape. That is a precursor in China's strategy to agreeing to US-China open skies. Only then can Delta's preferred mode of international operation - under an anti-trust immunised metal neutral joint venture - be permitted, as US policy only permits such JVs in an open skies environment. Delta has recently demonstrated equivocal attitudes to open skies where they do not specifically benefit it; but China would probably be one case where Delta and major friends could gain an edge on others. Meanwhile, there appears no abatement in what is already a fast-growing market.